Hot food takeaway business purchase agreement: comprehensive document covering stock, transfer of lease, website, full warranties, single or multiple outlets. This is a comprehensive agreement for the sale and purchase of a business by an individual, a company or any other organisation. Note: not suitable for sale of shares in a company. 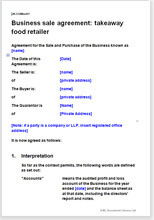 For a company sale, see Company sale agreements section. It is usual for the buyer to produce the sale document but there is no reason why the seller should not obtain an advantage by providing the first draft. Warranties have been used only so far as appropriate to the subject matter of the sale. The drafting notes contain a thorough explanation of how warranties work. The purchase price may be apportioned among the assets to assist in tax planning.